Wow, today was amazing. Definitely one to tick off the bucket list! I went to an all-day workshop with Joel Salatin (of Polyface Farm, brought to fame by Michael Pollan’s The Omnivore’s Dilemma), right here in Jamberoo. I was there with a bunch of friends from around town and from further afield, I met some interesting new people, and I finally got to meet Kirsten and Nick from Milkwood in person! Here’s me and my mate Adam (the other half of Fiona, from Inner Pickle), having a quick chat with Joel after the workshop. You won’t get those smiles off our faces for at least a couple of weeks! My head is spinning with all the ideas I heard today, and working out ways to scale them down to work on our acre. I’m going back over my notes, and I’ll be watching more of Joel’s videos on YouTube, and reading his books, to get even more ideas. But most importantly, Joel’s enthusiasm just fires you up to get out there and try stuff. One of his sayings that struck a chord with me was “if it’s worth doing, it’s worth doing poorly first”. There’ll be plenty of time to refine and get it right as you go. He actually used the example of a fox eating all your chickens as just a setback, something to learn from and move on from. I was hugely impressed that both the Mayor and Deputy Mayor of Kiama were there today. I think that shows the level of commitment they have to supporting localised and sustainable agriculture here. I’m sure they can’t have missed all Joel’s points about government regulations and bureaucracy getting in the way of producing and selling food on a local scale! I even got to try raw milk for the first time in my life, from a local dairy farmer. It was really good, like bought milk but better. Too bad I’ll probably never be able to have it again! I’ll post some more of my notes over the next few days, as I get it all straight in my head. It sounds like you had an awesome experience — one of these days we’re going to get in the car and go see his farm since it’s only about six hours away. (Same state even!) Or maybe pay for the multi-day tour he runs once a year. Which person in the photo is you? @Anna: Yeah, that saying stuck home for me! That’s me on the right in the photo. Visiting Polyface would be an amazing trip! This has perhaps been my major stumbling block in most things I’ve done or wanted to do. I’ve always wanted things to work out well from the beginning and have been discouraged when my first attempts don’t match expectations. Recognising the truth of such a simple statement might make a big difference to how I approach things from now on. @Tim: I’m very much the same. I spend a lot of time reading, and planning, and generally doing everything to get ready without actually starting a project! I’m slowly learning to just dive in and get started, and iterate towards something that works. As long as it doesn’t cost too much money :-). I was at the workshop too! I took a car load of people from Ryde, Sydney, yesterday to hear Joel speak. Like you, I am ‘scaling down’ his ideas to work on my 600m2 block here in Suburban Sydney. So many ideas & thoughts to process! I went home last night & talked to my children about “If it’s worth doing, it’s worth doing poorly first” – so much of what he shares is great for farming & parenting!! I loved the booklet he gives his apprentices – I think we will have to implement the 8 rules with our kids here at home. @Virginia: (nice site, by the way!) Joel’s thoughts on parenting also struck a chord with me. I love that he allowed his kids to set up their own businesses and learn about stuff on their own. I wonder if I can find a copy of that intern booklet online somewhere? Envious or what! Glad you got a lot out of it mate, and looking forward to reading your notes and words of wisdom from Joel. @Gavin: It was a great day, I hope my notes and recollections can do Joel justice! @Karan: I was at the movie in Gerringong too – I’ll have to write a post about it shortly. I really enjoyed it. The workshop day was a lot like Joel’s intro talk, but he went into much more detail and lots of nitty-gritty on how they do things, and more importantly, why they do things the way they do. He’s an amazing public speaker, obviously very experienced and comfortable with it! Kirsten from Milkwood grew up in Kiama and still has family here, so that’s one of the reasons they chose this area. I spoke to her on the day, and she also said they liked holding events in different regional locations to reach a wider audience, instead of always doing everything in Mudgee and Sydney. @Inner Pickle: Yes, we were on our best behaviour! @Kirsten: Thanks so much for putting it on! Hi Darren, wow Joel must have been getting around the country, I have to admit that I had to google to find out where Jamberoo was! The seminar today was great, lots to think about and I bought two of Joel’s books. I’ll write more on my blog when I’ve had some time to put it all together in my head. Nice to meet you 🙂 I’ll be interested to see what you apply at your place too. @farmer_liz: Yeah, Joel had a real whirlwind tour! I think he did 7 seminars in 7 days, over 3 states. I bet he’ll be glad to get back to the farm for some peace and quiet! So glad to read all of these comments following the RegenAG workshop with Joel organized by our illustrious NSW conveners Milkwood. Joel is a great supporter of RegenAG and we look forward to bringing him back to share his immense knowledge and ethical framework with others around Australia and the rest if the world. All the best to you all and please look at RegenAG.com for the other great workshops we’re holding this year. Yours and Growing, Darren Doherty, RegenAG Originator. @Darren: Thanks also for your part in organising this tour. It was an awesome mix of entertainment, motivation and really useful information. I don’t think I’ve ever sat through a seminar that I enjoyed more, and I’ve sat through a lot! It sounds like such a great workshop. I wish he’d come to New Zealand! @Emma: Maybe someone needs to start an NZ branch of RegenAG! I have to admit, though, I’ve been guilty of jealousy over some of the cool things you have going on over there – I’ve heard a lot of good things about the Nelson area, and have a friend moving to Atamai EcoVillage shortly. 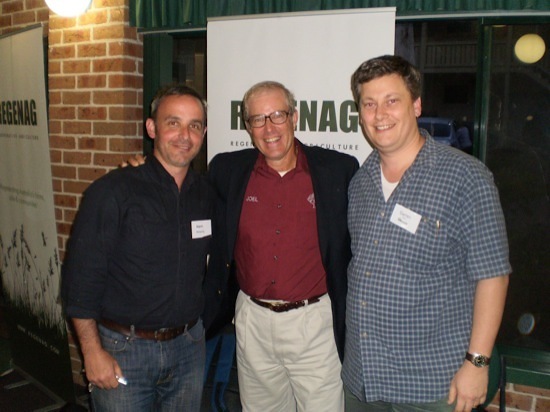 Joel Salatin is a really smart guy. He has some great ideas that anyone growing food can adapt to their own situation. I especially like his idea of being grass farmer instead of raising beef. That’s so different from most other cattle farmers in the States. @Bill: So true. While everything starts with the quality of the pasture, it’s fascinating to hear him talk about how to manage the animals in succession across that pasture to work with nature, breaking pest and disease cycles, rather than fighting nature by throwing money and chemicals at the problems as they pop up. You might have heard of Food, Inc, a documentary that features Joel. There also one that I hear less about called Fresh that he’s in as well (just search for Fresh documentary). @Chris: Thanks, I’ve seen both of those, and they’re both very good. Food Inc is a fantastic starting point for anyone wanting to learn more about how industrial food is grown, and how people like Joel are trying to change that. But why did you say you’ll probably never have raw milk again? @Stephanie: Only because it’s illegal here. I’d love to find a local supply, but don’t hold out much hope.